Clearance: 1/2" (12 mm) Chamfered edges provide 8 square inches of drainage area per block. Lift Provisions: A standard 7-strand galvanized steel cable loop at top center of block. Minimum Radius of Curvature: 100' (25 m) for walls one block thick. Standard Grade - One full and side face, free of large imperfections. Concrete color may vary between blocks. Utility - All surfaces may contain large surface blemishes, such as exposed aggregate, chips, etc. May be produced from colored concrete or contain architectural faces. Textured - Form casted pattern up to three faces. Concrete color may vary between blocks. 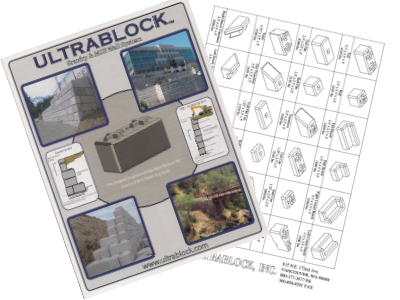 Concrete Strength: Blocks are manufactured with returned concrete and strength levels may vary. Extra charges will be quoted for guaranteed concrete strength, if required.